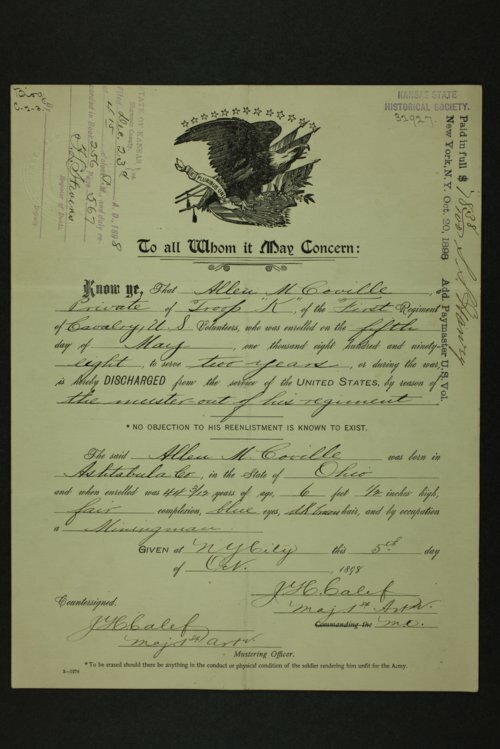 This is a small collection of papers relating to Allen M. Coville's childhood years spent on a farm west of Topeka, and to his service in Theodore Roosevelt's Rough Riders during the Spanish-American War. Coville's family moved from Ohio to Kansas in 1855, when Coville was seven years old. Colville grew up during the Border Wars and wrote down his memories of the time period. He recalls conflicts between abolitionists and pro-slavery groups, skirmishes that occurred between Native American tribes, and encounters with neighbors, including a Kaw chief he refers to as "White Plume". His account of his experiences with the Rough Riders, and his discharge, signed by Roosevelt, are also in the collection. Funds for digitization provided by Mr. Steve Peckel in memory of William Chalfant. A typed transcript of his time with the Rough Riders begins on page 62 of Folder 3. However Coville's account stops before he gets to Cuba. The typed transcript for his description of his experiences during the Border Wars begins on page 51 of Folder 4. Collections - Manuscript - Coville, Allen M.
People - Notable Kansans - Coville, A.M.